The inside passage route run by BC Ferries offers guests an easy way to travel from Port Hardy to Prince Rupert or vice versa. 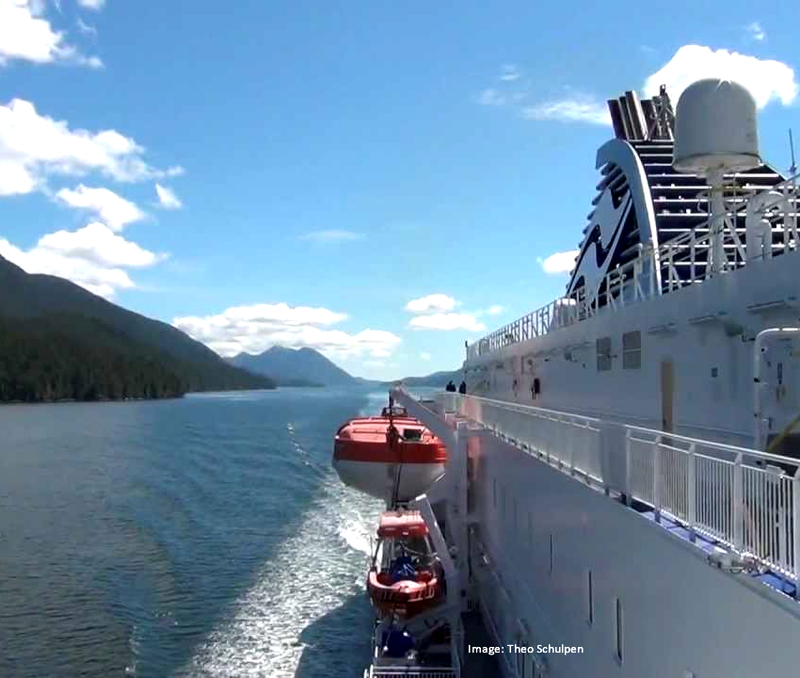 The approximately 15-hour trip is 274 nautical miles and travels through the pristine waters of British Columbia’s coast. Recreational vehicles, cars, trucks and walk-on passengers are all accommodated on the M.V. Northern Expedition, which is one of BC Ferries newest fleet members. The M.V. Northern Expedition holds 115 vehicles and has a restaurant, lounge, gift shop, kid zone, staterooms and a pet area. Guests often see bald eagles, sea lions, seals, porpoise and of course whales on the voyage. During the summer this route runs direct from Port Hardy to Prince Rupert every other day. During the fall/winter/spring the route makes quick stops in Klemtu and Bella Bella and the ferry runs less frequently. The BC Ferries terminal is located five minutes north of Port Hardy in Bear Cove. When driving on Highway 19 towards Port Hardy turn right at the Bear Cove Highway intersection. There will be a sign for the ferry terminal and you will drive on this road for 3-4 minutes before it dead ends at the ferry terminal line up. It is recommended to be at the ferry terminal at least two hours prior to departure, and reservations that have not been checked in 1.5 hours before departure may be cancelled and guests will have to travel on standby. There are no services at the BC Ferries terminal in Port Hardy, so we recommend going with plenty of snacks and spend your time trip planning or taking in the beautiful views of Hardy Bay while you wait. If you are looking to grab a tasty treat and a coffee for the wait we highly recommend Café Guido at 7135 Market Street in Port Hardy. For groceries there is Save On Foods that is located at 8950 Granville Street. This is the only grocery store in Port Hardy. Port Hardy is located at the northern tip of Vancouver Island and is surrounded by natural beauty. We may be biased (we moved back here after living in sunny California and don’t regret it for a second), but this place is heaven for anyone who loves to explore and enjoy the natural world. The streets are quite, the beaches aren’t busy and the locals are very friendly. There are endless places to explore and have an authentic, off-the-beaten path trip. Feel free to contact us with any questions about the area!